Whether you favor fruit, chocolate or nuts, alcohol infused or lead-free, baked or no-bake, I've got the pie for your pi day celebration. Which one will you choose? Pies for Pi Day. I have to admit that this was a new concept for me. When my kids were in elementary school they came home with a letter from the teacher at the beginning of March. 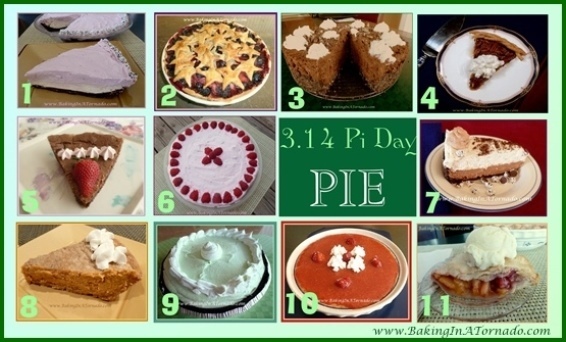 They would be celebrating Pi, 3.14, by eating pie on 3/14. They asked if parents would be willing to bake something for the celebration. I don't know why pi, a mathematical constant and the ratio of a circle's circumference to its diameter, needs to be celebrated but pie certainly should. So yeah, I'm in. Needless to say a building full of kids and a gigantic table packed with pies was a huge hit. My boys each got to pick their favorite two pies, one I'd send to school with them and one we'd have at home for dessert. The boys are in college now, but I'm still celebrating pie (I mean pi) on 3/14. All the flavors of childhood in pie form. This one has a cookie crust that's baked but the rest sets up in the fridge. You might think it would be just for kids but adults love it as well. This is such a simple pie to put together and it's bursting with berry flavor. Whatever berries look plump and juicy at the grocery store you can use in this pie. This no-bake pie marries dark chocolate with mint in a tall decadent dessert. The first pie was devoured so quickly I had to make a second one. This is definitely not your mama's pecan pie. I kick mine up a notch by infusing it with alcohol and adding a unique surprise flavor ingredient. This thick fudgy pie is a recipe I developed for Passover, but there are instructions to easily adapt this treat for any time of year. Three different flavors of Greek yogurt come together in this refreshing no-bake pie. This pie starts with a dark chocolate crust and is topped with a dark chocolate cheesecake layer and a whipped cookies and cream layer. Divine. Yes, I know everyone makes a pumpkin pie, but mine is the best. Just ask my kids. This is my go-to pie when I'm in a rush. It requires only a few ingredients that most people have in their home and I even use a purchased pie crust. Strawberries and cream flavor in pie form. The shortbread style crust is topped with a cream cheese layer and a pureed fresh strawberry layer. Delish. I love this versatile pie because you can put it together based on what fruits look best at your grocery store. I mix stone fruits and berries for this light and flavorful treat. As always, any time you make one of my recipes, feel free to post a picture of it to my Baking In A Tornado Facebook Page . I'd love to see it! Karen's been featured on websites including TODAY Parenting Team, BLUNTMoms, BlogHer, The Daily Meal, Mamapedia, Scary Mommy, Treat a Day, MyFoodies, Midlife Boulevard and BA50. She's a BlogHer Influencer as well as a contributor to The Culinary Content Network, Felicity Huffman's What the Flicka and TODAY.com. Karen has been published in the Life Well Blogged series and co-authored the book The Mother of all Meltdowns.